Providing a highly versatile and practical storage option for any work environment, our 4oz Containers and Lids come in an economically large pack of 100. 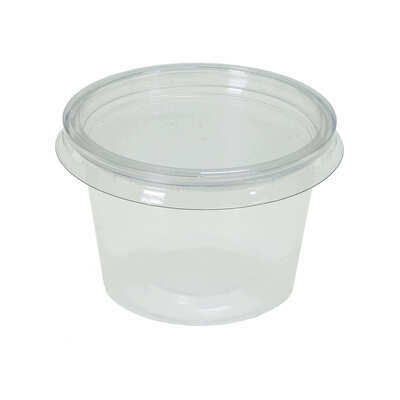 Suitable for all manner of actions from storing food safely to standing in as paint pots in a busy classroom, these durable pots have been made from polypropylene making them lightweight and easily reusable. Suitable for use in a microwave or fridge, these containers are highly resistant to fats and oils and make for an ecological choice with their recyclable plastic build. The accompanying lids allow foods to be locked in for freshness while also offering an air tight seal for paints or a secure lid should you use your containers to store small items such as assorted buttons. If catering is your field of expertise, Gompels also stock a wide range of napkins, table covers and cutlery in our Tableware & Napkins category. Should you choose to incorporate these pots in your Arts and Crafts supplies, they are the ideal size for separating out our Assorted Buttons or Assorted Ribbons for each of your students and also promise to securely hold our Assorted Paints with ease.